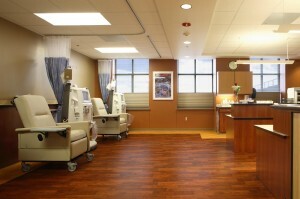 Dialysis treatments can be performed in a hospital setting. But if you are going to receive regular care, it is likely that you will get those treatments at a dialysis center, unless you have chosen to perform dialysis at home. When you and your nephrologist have decided that it is time for you to begin dialysis and you have chosen the type of dialysis you prefer, you will go to a hospital to have your dialysis access created (article #41). Once you have a working access, your nephrologist will make arrangements for you to visit a dialysis center for your regular dialysis treatments. The dialysis center can give you dialysis treatments or assist you with home dialysis, depending on which type of dialysis you have chosen. However, there may be times when you wish to investigate other dialysis centers. Perhaps you are not having a good experience at your current dialysis center, and you wish to find a better one. Dialysis centers are like any other medical providers—some are better than others. Or perhaps you would prefer a dialysis center with different policies or amenities. Not all types of dialysis are offered at all dialysis centers. Some dialysis centers allow family members to visit; others do not. Some provide Wi-Fi for their patients; others do not. Some allow you to eat something during the treatment; others do not. You need to find a dialysis center with which you will feel comfortable. Or perhaps you plan to be on travel, and you need to find a dialysis center at the location to which you will be traveling. Some dialysis centers routinely accept traveling patients; others do not. Or perhaps you are planning to move to a new location, and you need to find a dialysis center for regular treatment there. Your social worker can find a suitable dialysis center for you. Alternatively, you can search for a dialysis center yourself. Here are some online resources to help you search for dialysis centers. Dialysisfinder lets you find dialysis centers by entering a city and state or a Zip code. It seems to emphasize centers run by DaVita, a major operator of dialysis centers in America; but other centers are listed as well. DialysisCenters.org lists over 5,000 dialysis centers, which you can find by entering a city and state or a Zip code. “The List,” in the July 2011 issue of Dialysis and Transplantation, is a comprehensive list of dialysis centers that accept traveling patients. The types of dialysis offered by each center are shown. The List was published annually. Unfortunately, Dialysis and Transplantation ceased publication in October 2011, so The List may no longer be up to date. Medicare has created Dialysis Facility Compare which lets you find and compare Medicare-certified dialysis centers for their locations and treatments and for quality information like survival rates. You can find dialysis centers by entering a city and state, a Zip code, or the name of the center. Quality data on centers is updated quarterly. To help evaluate a dialysis center for suitability and quality of treatment, Medicare has also made available a suggested list of questions to ask the center, and a set of criteria for evaluating the center. If possible, visit a prospective dialysis center to evaluate its suitability for your needs before deciding whether to start treatment there. Talk with the staff. Ask some of the patients there about their own experiences at the center. If the center has done a Patient Satisfaction Survey recently, ask the staff for the results. Global Dialysis maintains a database of dialysis centers in 161 foreign countries. Users are encouraged to post reviews of their centers, a valuable resource for other patients seeking quality care. The International Dialysis Organisation (IDO) makes available a guide to dialysis centers worldwide. IDO claims their guide is quite comprehensive—but you have to pay to order a copy.